Motion pictures are made, not mass produced, requiring a remarkable collection of skills, self-discipline, and sociality—all of which are sources of enormous pride among Hollywood’s craft and creative workers. The interviews collected here showcase the ingenuity, enthusiasm, and aesthetic pleasures that attract people to careers in the film and television industries. They also reflect critically on changes in the workplace brought about by corporate conglomeration and globalization. Rather than offer publicity-friendly anecdotes by marquee celebrities, Voices of Labor presents off-screen observations about the everyday realities of Global Hollywood. 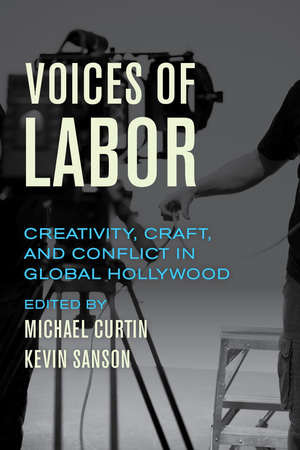 Ranging across job categories—from showrunner to make-up artist to location manager—this collection features voices of labor from Los Angeles, Atlanta, Prague, and Vancouver. Together they show how seemingly abstract concepts like conglomeration, financialization, and globalization are crucial tools for understanding contemporary Hollywood and for reflecting more generally on changes and challenges in the screen media workplace and our culture at large. Despite such formidable concerns, what nevertheless shines through is a commitment to craftwork and collaboration that provides the means to imagine and instigate future alternatives for screen media labor. Michael Curtin is Duncan and Suzanne Mellichamp Professor of Film and Media Studies and director of the Global Dynamics Initiative at University of California, Santa Barbara. Kevin Sanson is a lecturer in the Creative Industries Faculty at Queensland University of Technology and managing editor of Media Industries.